Here we go again. For those who may agree but are a little tired of my crying out for discernment regarding “biblical” movies, you have my apology…in the midst of my growing concern. Nevertheless, I covet your prayers for our brothers and sisters in Christ and for the multiple millions of the lost who are being presented with a caricature of the biblical Son of God in yet another Hollywood translation of the Word of God. Is it? Who is the Jesus that is capturing their attention? How close is the movie presentation to the biblical account? Does it make any difference? No matter how close a counterfeit twenty-dollar bill is to the real thing, it’s still a fake. Legal issues and deception aside, it has no value as a currency. Yet someone who isn’t aware that the bill is fake may be thrilled initially if he were to stumble upon a satchel of such twenties. The thrill would end quickly, however, when he tried to spend the bogus money. Although the analogy is a bit rough, it still brings to light some important issues. Jesus, the only begotten Son of God, who is the image of the invisible God and the One in whom dwells all the fullness of the Godhead, is not someone who should be portrayed (counterfeited would be more accurate) by a fallen, finite being—Christian or otherwise. Any such attempt will result in another Jesus, a false Christ. According to the Bible, all Christians who have been truly born again have a personal, intimate relationship with Jesus Christ, and that relationship has (or should have) developed and matured by one’s getting to know Him through His Word, through prayer, and through obedience to His teachings. I’ve known Jesus personally for nearly four decades, and by God’s grace, my relationship with Him continues to grow. How would that relationship be strengthened by my watching someone who is obviously not Jesus but who is attempting through his acting to reflect the divine attributes of the Son of God? It can’t happen. Let’s consider some other examples that I hope will show just how wrong is any attempt to depict Jesus, who Scripture tells us is the brightness of God’s glory and the express image of His person, and just how impossible it is to reveal His supernatural attributes and His divine personality on the screen. A recent movie gave historic as well as Hollywood insights into the life of Abraham Lincoln. The actor who played Lincoln was superbly convincing. He certainly looked like Lincoln, at least based on the photographs we have of our former president. He did some things that we know Lincoln did from historic accounts, to the degree that the accounts are true. Beyond that, we have a view of Lincoln that was conjured up by the creative artists of Hollywood and was convincingly realistic but not accurate to the man himself. Nor could it be. Why? None of the creative artists of Hollywood were around when our former president lived, so none of them knew him personally. They have created an image of Lincoln that may reflect some truths about him, but they have also added much of their own conjecture. Now let’s get to the point of the two examples. Suppose that Jesus was sitting beside me in a theater as we watched a marathon of “biblical” movies that featured an actor who was attempting to portray Him. Would He consider these to be merely a form of entertainment—just a dramatization of His earthly life? Would He be thrilled by the ones that seemed to be the “most accurate”? No. I wonder if His response might include the word “blasphemy.” Noah Webster (who knew the Bible well), in his 1828 dictionary, wrote that blasphemy is “an injury offered to God by denying that which is due and belonging to Him, or attributing to Him that which is not agreeable to His nature.” That would cover every attempt by men to portray the God-Man Jesus. The result can only be a false Christ, and Jesus warned that a proliferation of such would characterize the days prior to His return (Matthew:24:5). Since a host of very influential evangelical leaders (Rick Warren, Luis Palau, Max Lucado, Francis Chan, Pat Robertson, Andy Stanley, Joel Osteen, T.D. Jakes, Sam Rodriguez, Geoff Tunnicliffe, Leith Anderson, Ro Chang Soo, Erwin McManus, Jim-Bob Park, Bill Hybels, James O. Davis, Craig Groeschel, Miles McPherson, Jimmy Mellado, along with a number of Catholic bishops and a Cardinal) have been singing the praises ofThe Son of God and the History Channel’s Bible series that spawned it, it raises a very serious question regarding their view of the Bible . If they truly believe that the Bible is the Word of God, that it is His God-breathed, inerrant revelation to mankind, how could they glorify a production by men that claims to bring “the story of Jesus’ life to audiences through compelling cinematic storytelling…” and in the process utterly destroys the critical truth aspect of the Scriptures? Evidently these leaders had no problem with the distortion of the Word in scene after scene. Did the wise men show up at the stable right after the birth of Jesus? Did Jesus entice Peter to follow him by filling his nets with fish? Did Jesus draw the fish into Peter’s net by swishing the water with his fingers? Was Mary Magdalene the lone woman among the small band of disciples (if not one of the apostles)? Did Nicodemus play the good Pharisee/bad Pharisee, even challenging Jesus about paying taxes? Was Pilate a brutal military leader who threatened to shut down the temple? Did Jesus have confrontational exchanges with Barabbas? Did Jesus tickle a little girl and playfully tell her that the temple would be utterly destroyed? At the Last Supper, did Jesus drink the wine that he had just called his own blood? Did the mother of Jesus wash his bloody body in preparation for his burial? Did Jesus unsymbolically appear to John on Patmos? The list of unbiblical and extra-biblical scenes goes on and on. One would think that a Christian leader who truly cares about the Scriptures would take seriously the admonitions not to add to it. Nevertheless, nearly every scene in the film features conversations that the screenwriters made up along with numerous contrived monologues by “Jesus.” How could any believer condone putting words into the mouth of biblical characters and especially into the mouth of one’s Lord and Savior? Yet that must take place in order to make a cinematic dramatization of the Bible. Neither the words of Scripture nor the descriptions found within its pages suffice—therefore every scene has to be fabricated from the creative albeit fallen minds of men. Jesus declared in John:17:17: “Sanctify them through thy truth: thy word is truth.” But in defense of the movie, one might argue that much of what was presented upheld the truth of the Scriptures. How much? We could say the same thing in defense of the erroneous New World Translation bible produced by the Jehovah’s Witnesses or the blasphemous Message bible. “Much,” or “quantity,” is not the criterion for qualifying something as true to God’s Word. The Bible, which is God’s inerrant communication to mankind, is a believer’s absolute authority in all matters of faith and practice. If only much of it were true, then it is neither inerrant nor can it be a believer’s authority. A so-called biblical movie—any biblical movie—can never be truly biblical for what should be obvious reasons. This is an attempt to visuallyreproduce a Book that is itself objective and supernatural. First of all, the Bible cannot be translated visually without removing it from its objective nature. Moses did not receive a picture book on Mount Sinai. God communicated to him in words that were written down. Therefore, the communication can be objectively understood through hermeneutics, the science of interpretation. That has to be the basis for believers to come to a common understanding of what God has communicated. The interpretation of pictures, on the other hand, lacks that objectivity and nearly always involves a subjective understanding. For example, ask a handful of people to give you their impressions of a certain painting and you will get quite varied responses. Then ask what they believe the artist is communicating. Again, their replies will nearly always be different because the communication is in a subjective medium rather than one that is objective. A biblical movie is a visual interpretation. The making of theatrical movies is a very expensive collaborative process that involves creative input from numerous personnel and has as its primary goal the entertainment of audiences that will ultimately translate into a box office success. Decisions are often made on the basis of production costs, location problems, actors’ egos, the director’s and writers’ ideas, producers’ whims, studio pressure, weather, etc., etc. Rarely, if ever, would the truth of the content presented be a major issue, especially to the degree that it would trump other considerations. What does that tell you in regard to bringing the Bible, the Word of God, to the silver screen? One of the amazing characteristics of visual media is the power of imagery. Scenes that appear on the screen can remain with a viewer, popping into the mind occasionally over his or her lifetime. That can be spiritually devastating. I’ve heard that some believers who watched Mel Gibson’s “biblical” movie, The Passion of the Christ , had great trouble dismissing the face of James Caviezel when their thoughts turned to Jesus, even while in prayer. Not everyone saw that as a problem. One woman complained about our criticism of The Passion , noting that she believed she was greatly blessed to have Caviezel as a tangible image of Jesus for her prayers. In contrast, as Dave Hunt and I left the theater after reviewing Mel’s movie, I remember Dave crying out to the Lord to remove the imagery of the counterfeit Christ that had just invaded his mind! ; Acts:17:29)? Even with no biblical basis and in light of its condemnation, false images of Jesus abound, from Eastern and Russian Orthodox icons to classic Catholic works of art; and to those we must add the numerous portrayals of Christ in the movies. Scriptural censuring aside (because too few seem to care or heed what the Bible says), of what possible value would there be in a misrepresentation of Jesus—especially for those who claim to know Him personally? As Dave Hunt has noted, “Wouldn’t that be like a man carrying a picture of a beautiful actress in his wallet under the guise of ‘she reminds me of my wife’”? What might his wife think of that? What might it do to their relationship? We could ask the same question regarding our own intimate relationship with Jesus. Wouldn’t that grieve Him? When Jesus asked Peter three times if he loved Him, Peter replied, “Thou knowest that I love thee.” Following Peter’s responses, Jesus commanded him to “feed My lambs, feed My sheep.” What, then, of today’s shepherds who are feeding their sheep a diet created by Hollywood, put together by hirelings? What of those highly influential Christian leaders who have endorsed the Son of God , who have given themselves to ad campaigns for the movie, whose churches have purchased nearly 500,000 theater seats (prior to the film’s opening) for their flocks? Is it truly the love of God’s sheep and His Word that is persuading them to lead His flock into grievous error? The incredible power of the medium of film resides in its capacity to impact emotions through imagery, acting, dialogue, and music. Tears can flow even in animated movies. 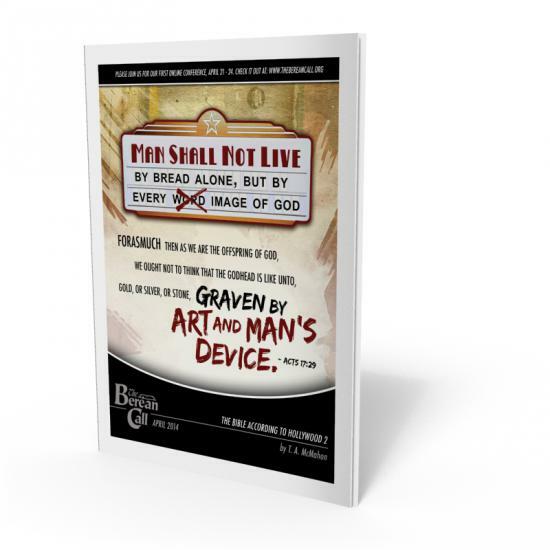 People can have artificial “life-changing” experiences based upon what they see on the screen, but the Word of God declares: “the flesh profiteth nothing” (John:6:63). A movie-generated catharsis may affect a person experientially , but it cannot enrich him spiritually , nor can it save anyone who is lost. Is grammatical delusion alive and well among those who claim Jesus as Lord and Savior? You make the call. Is it a grammatical delusion to state that "and" is not a conjunction linking who believes and is baptized will be saved? Its is a grammatical delusion to profess that "and" is not a conjunction linking repent, and let every one of you be baptized ....for the remission of sins. Is it a grammatical delusion to suggest that "for" in Acts 2:38 actually means "because of". GRAMMATICAL DELUSION IS ALIVE AND WELL IN MANY DENOMINATIONS TODAY. Do you trust God's written word or man-made grammatical delusion? Belief, repentance, and immersion in water are all essential in order to be saved. Do not fall into the trap of grammatical delusion.